In continuing with my efforts to inform the public about different simulator games today I will discuss an unusual piece, the Zamperla Telecombat. This machine is an unusual combination of Amusement Ride crosses arcade game. I have always thought this was quite a nice combination because if your an amusement ride enthusiast like me, and also like arcade games, then this becomes the ultimate, perfect simulator for you. 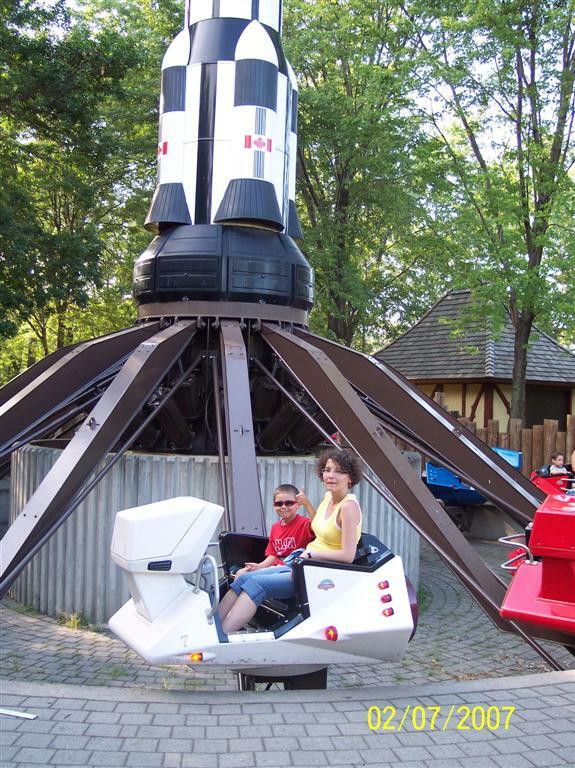 I only know of one instance of this ride existing, and that is in the Amusement Park Marineland, which is located in Niagara Falls, Ontario, Canada. There are other rides called the telecombat but they are not the same as this particular ride. There is little information about this ride however I believe it was installed in the park in the late 1980’s. It definitely has the late 80’s or even early 80’s type graphics so it is a classic machine and not something modern. This is technically an amusement ride, so it has multiple ride vehicles, probably about 10-12 2 person pods. 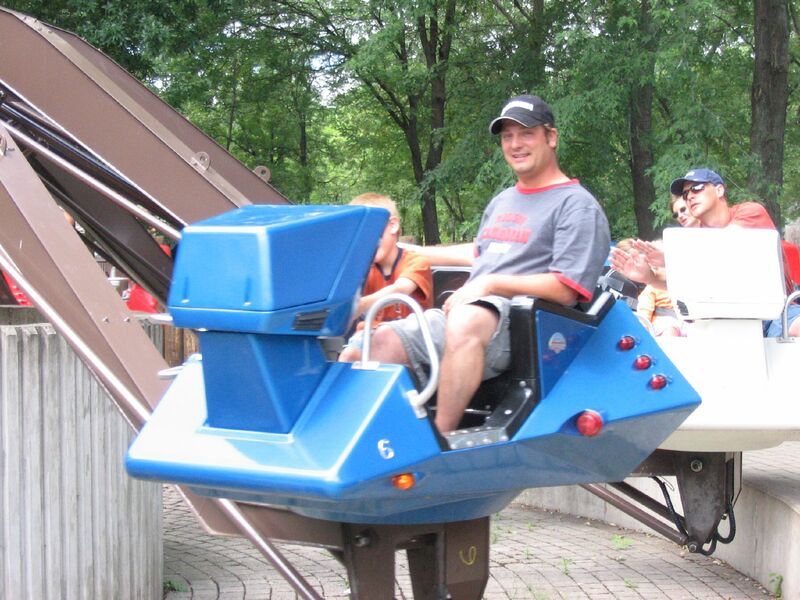 The ride accomodates both children and adults. Once you get into the ride and strap yourself in you are faced with a joystick similar to Space Harrier with a trigger on top. I haven’t been to Marineland since about 8th grade so my mind may be a bit fuzzy on some of these details. When the ride starts you see the other pods on the screen, which correspond to the actual pods on the ride. The object of the game is to shoot down the pods on the screen, and when you hit one, the actual pod is sent spinning and it lowers to the ground to indicate a hit. If someone else hits the pod you are in on the screen, then your pod will descend as well. The pods spin around and raise and lower with movement corresponding to the way you move the joystick. From what I remember this ride does not work very well and its quite complex to maintain. The monitors are also difficult to see in the sunlight so the experience is hampered a bit. Its very cool and unique though and has that great late 1980’s feel to it. I am actually surprised they are still operating this ride, and I hope they don’t decide to get rid of it for something newer. Here are some pictures of the ride. Click the link and picture to see them. If anyone can elaborate on this ride, such as year of installation and futher details on its game play I welcome any comments about it. It took me a lot of searching to find your article, and I thank you for it. When I was a kid, around 7 or 8, my parents took me to Forest Fair Mall in Cincinnati, which had this game/ride. I have recently been trying to dig up some information on it. You asked about game play. It was a black screen with white graphics, similar to “Asteroids.” I can’t remember if it was vector graphics or not, but I am leaning towards that being the case. Since it was indoors, the screen was pretty easy to see. Each player/pod was represented by a spaceship. It was a top down view. Each ship looked similar to the original Enterprise from “Star Trek” (the original series). As you said, if you shoot a ship it will cause the player’s pod to spin out of control. I remember that if you start out just right you can turn sideways and kill everyone in a row as the game is beginning. I was hoping to also find a ROM or a screenshot of the game, but seeing a picture of it is wonderful.